Matthew 5 starts with ” when Jesus saw the crowds, he went up the mountain, and after he sat down, his disciples came to him. Then, he began to speak, and taught them, saying, “Blessed are the poor in spirit for theirs is the kingdom of heaven”… Jesus spoke of blessings for such is the intent of his coming. He wanted his people to experience God first hand in the Beatitudes, blessings. One thing that stands out in the gospel is the way Jesus engages his would be disciples. His compassion and care touch the depths of people. He knew their struggles, hardships and sufferings. Jesus shared the lessons of the Good News through stories- of familiar sights, sounds, activities, places and other day to day realities. Jesus gave a new set of standards by which the disciples were to live. On a mountain top, he gently said ” Blessed are the poor.,”; for his heart is always moved with compassion for the poor. Poverty and misery has been the fate of C.P. a 22 year old girl we met during the latest CFC Surgical Mission in Baybay, Leyte. Hers is the poignant story of one ordinary person who suffered quietly throughout her 22 years, without even hoping for an end to the string of her heartaches. That is, until she unexpectedly experienced a life-changing God incident. She is an orphan, having lost both her parents at a tender age. As if that tragedy is not enough, she was born with a deformity of her buttocks that she carried as a burden and a shame. She carried that huge misshaped tumor like a badge of shame ( a neurofibroma located on the left side of her buttocks). Left without parents, and without any relatives to take care of her, it seemed like a dead end. However, fate was kind to her as she was taken in and cared for by her mother’s friend, a former classmate during their elementary school days. At last, she found a home and a surrogate family. Growing up ,she went to public school . Even from her young years, growing up was not easy for her. She grew up with an inferiority complex caused by the unsightly bulge of her backside, calling attention to it every time. Not a day passed that she did not have to bear the taunts and jeers of other children. (In today’s world, bullying). No matter how she tried to hide her deformity, it simply stands out , bulging through her clothing. No matter how much the children of her guardian tried to protect and shield her ,they were not always successful, as they were not always there by her side. She earned the humiliating ‘ nickname ‘ of ‘Jollibee’ because of the similarity of her behind to that of the famous mascot of a popular food chain. 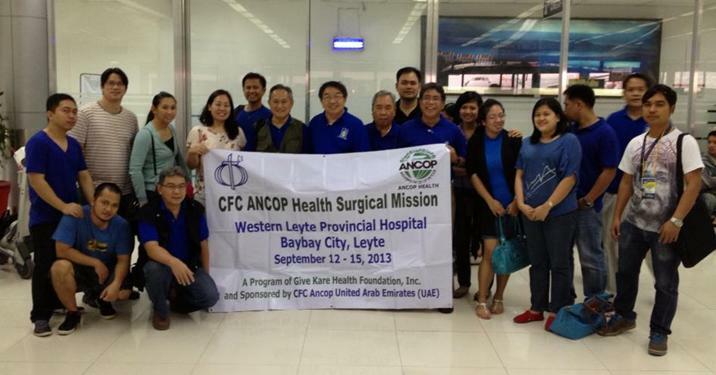 One day,the CFC Surgical team comes to their town to do charity surgeries. Hearing about it,she made a decision to cast her lot. Somehow ,she saw a glimmer of hope from that news. For her,it was probably the one long shot for a much awaited miracle. Mustering all the courage she could get and with much prayer, she presented herself to the team for treatment. The CFC doctors took a careful look at her, evaluated her case and decided to put her on the list and prioritized her for treatment, especially after learning the circumstances of her life. The compassionate care she received overwhelmed her and her surrogate family. She cried in gratitude to God for having brought her to the loving care of the CFC doctors. Her fear and humiliation was replaced by tears of joy and happiness. Two days after her life changing surgery, she stood erect and walked slowly yet confidently despite the postoperative pain. From here on, she knows that she has a beautiful life to live , one with a future full of hope. She knows that she has experienced up close the Beatitude, the blessing that God promises to be true for his children.